6501. “Robert Lee Clower,” Find-A-Grave, https://www.findagrave.com/memorial/16467525, 16467525. 6502. “Sarah Elizabeth Crabtree Clower,” Find-A-Grave, https://www.findagrave.com/memorial/16467529, 16467529. 6503. “Cleveland Clower,” Find-A-Grave, https://www.findagrave.com/memorial/16467523, 16467523. 6504. “Charlie Victory Clower,” Find-A-Grave, https://www.findagrave.com/memorial/16467518, 16467518. 6505. 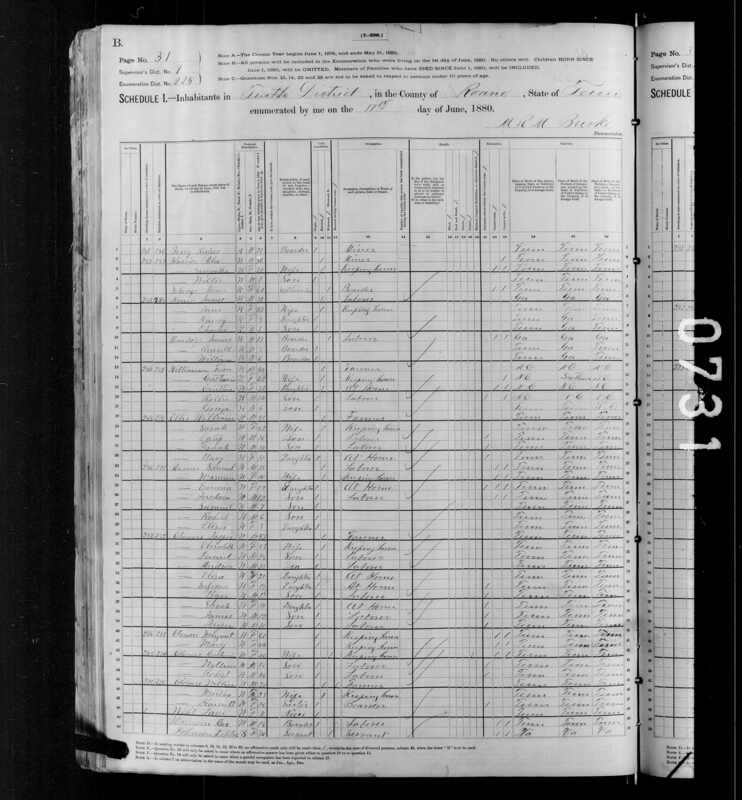 Robert L Clower and Sarah Elizabeth Crabtree, “Tennessee, County Marriages, 1790-1950,” September 11, 1884, Roane County, TN, https://www.familysearch.org/ark:/61903/1:1:X8Y2-XLZ. 6506. “W Y Clower,” Find-A-Grave, https://www.findagrave.com/memorial/66844206, 66844206. 6507. “Annie L Clower,” Find-A-Grave, https://www.findagrave.com/memorial/66844235, 66844235. 6508. 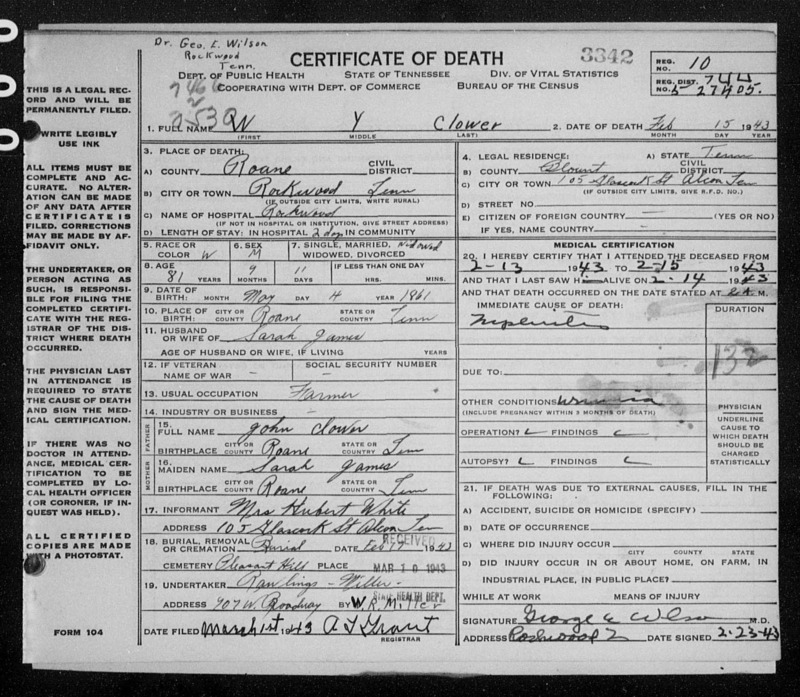 W Y Clower, “Tennessee Death Records, 1914-1963,” February 15, 1943, Rockwood Hospital, Rowckwood, Roane County, TN, https://www.familysearch.org/ark:/61903/1:1:NS6M-DZB. 6509. 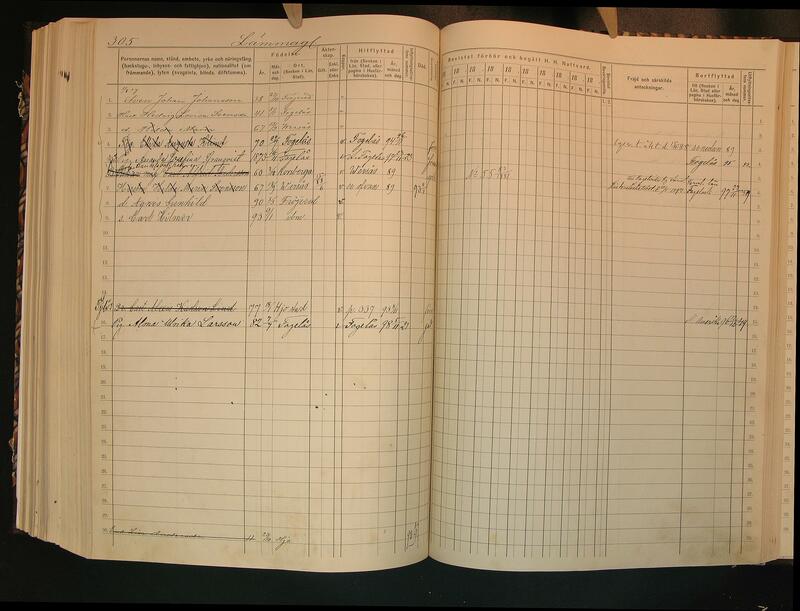 “United States Census,” 1910, TN, Roane County, District 04, 8A, 2, 154, T624, 1375530, 9001, 328, Bureau of the Census, US Dept. of Commerce, United States of America, April 28, 1910, Will B Campbell. 6510. 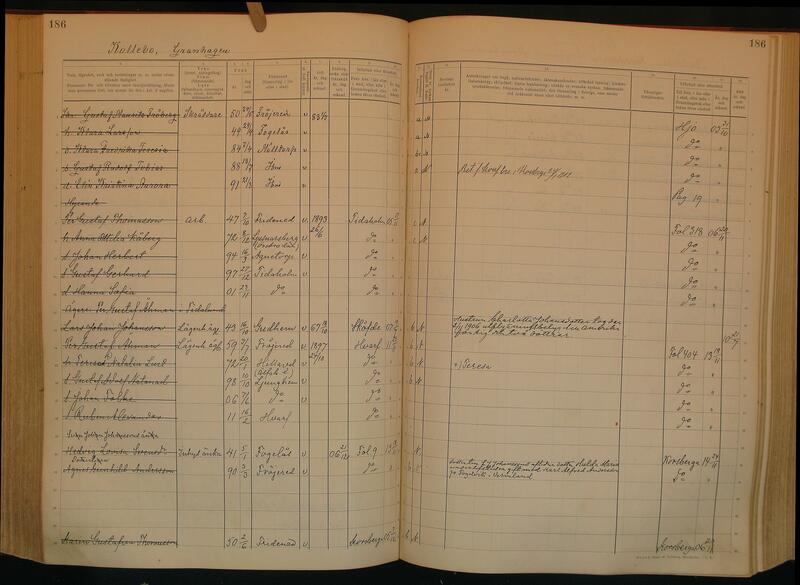 “United States Census,” 1900, TN, Meigs County, District 07, 6B, 3, 107, T623, 4118702, 187, 360, Bureau of the Census, US Dept. of Commerce, United States of America, June 8, 1900, John B Adams. 6511. 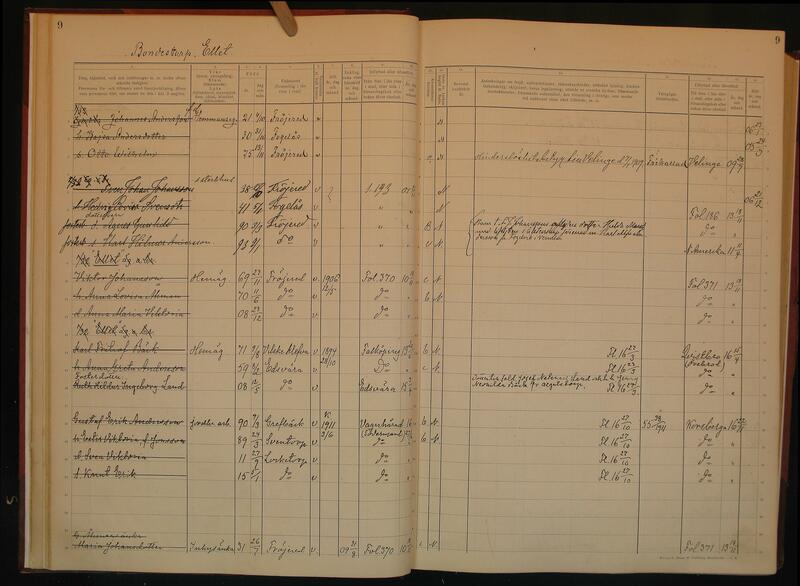 “United States Census,” 1920, TN, Roane County, District 04, 8A, 2, 165, T625, 4968812, 4207, 908, Bureau of the Census, US Dept. of Commerce, United States of America, January 19, 1920, Thomas C Hickey. 6512. W Y Clowers and Annie L Clowers, “Tennessee, County Marriages, 1790-1950,” December 22, 1889, Roane County, TN, https://www.familysearch.org/ark:/61903/1:1:X8YL-S2S. 6513. 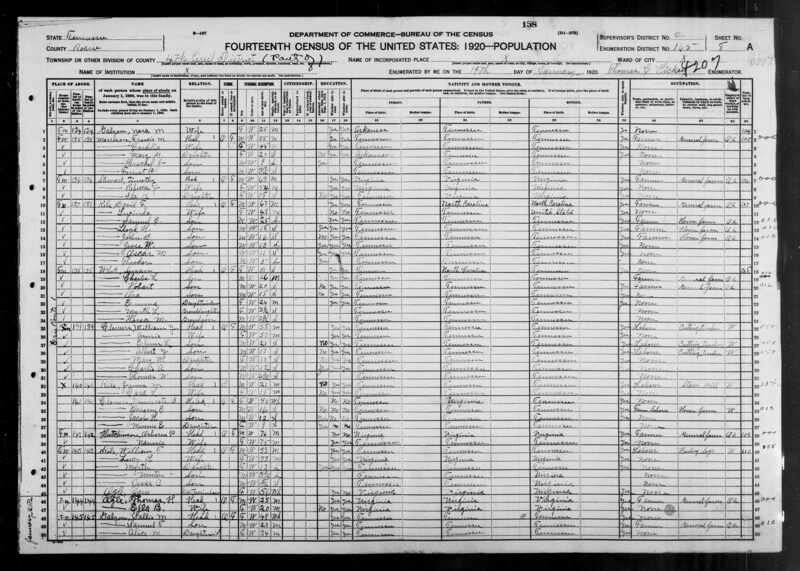 “United States Census,” 1880, TN, Roane County, District 10, 31B, 7, 225, T9, 1255275, 353, 715, Bureau of the Census, US Dept. of Commerce, United States of America, June 17, 1880, M R M Burke. 6514. “Raymond Edward Clower,” Find-A-Grave, https://www.findagrave.com/memorial/39588682, 39588682. 6515. “Obituary,” Lelia Evelyn Clower Phillips. Lelia Evelyn Clower Phillips, age 91, of Kingston passed away Thursday, April 28, 2016 at Harriman Health & Rehab Center. She was born March 22, 1925 in Roane County and was a member of Chapman Grove Baptist Church and loved attending as long as her health permitted. She was also a member of the Order of Eastern Star. Lelia had worked for several years at K-25 in the cafeteria before going to work at Paint Rock Grocery Store. Later she owned and operated Lelia’s Beauty Salon in Kingston. When not working she enjoyed gardening and loved spending time with her family and friends. Preceded in death by her husband, Howard Ray Phillips; parents, Elmer Lee & Artie Mae Phifer Clower; brothers, Arnold Lee, Clyde Willis, Raymond Edward & John Clower; also 2 infant brothers and 1 infant sister. The family will receive friends 11:00 – 1:00 p.m., Monday, May 2, 2016 at Fraker Funeral Home with funeral service following at 1:00 p.m., in the chapel with Rev. Adrian Jones & Bro. Glenn Clower officiating. Graveside service will follow the funeral at Kingston Memorial Gardens. Online register book can be signed at www.frakerfuneralhome.net . Fraker Funeral Home of Kingston is in charge of all the arrangements. 6516. “Elijah “Lige” Price,” Find-A-Grave, https://www.findagrave.com/memorial/73040132, 73040132. 6517. “Obituaries,” Jon Warrington, The Grand Island Independent, Grand Island, NE, May 22, 2002. GIBBON — Jon M. Warrington, 28, of Gibbon died Saturday, May 18, 2002, at his parent's home in Gibbon from a terminal illness. Services will be at 2 p.m. Friday at Gibbon Baptist Church. The Rev. Robert H. Flynn will officiate. Burial will be in Minden Cemetery with military rites provided by the U.S. Marine Corps. Memorials are suggested to the "Staff Sargent Jon M. Warrington Memorial Scholarship Fund." Godberson Mortuary in Gibbon is in charge of arrangements. Mr. Warrington was born July 10, 1973, at Minden to James A. and Candice R. (Lusk) Warrington. He grew up in Gibbon, graduating from Gibbon High School in 1992. He enlisted in the U.S. Marine Corps after high school and was stationed in San Diego. His military career took him to Camp LeJeune, N.C., Yuma Proving Grounds (LAV Tests Directorate), Yuma, Ariz., and Camp Pendelton, Calif., (SOI-LAV Instructor). He retired from the military as an E-6 Staff Sargent due to ill health and moved back to Gibbon. He married Sheri Loper on May 14, 1994, in Jacksonville, N.C. The couple lived at the military bases where he was stationed. He was a member of Gibbon Baptist Church and U.S. Marine Corps-retired. Survivors include his wife; a son, Colter of Gibbon; his parents of Gibbon; brothers, Kris of Gibbon, Brion of Omaha and Dan of Kearney; grandparents, Virgil and Ruth Lusk of Minden and Charles Warrington of Gibbon. He was preceded in death by triplet sons at birth and his grandmother. 6518. “Virgil Leroy Lusk,” Find-A-Grave, https://www.findagrave.com/memorial/22888882, 22888882. 6519. “Ruth Daily Lusk,” Find-A-Grave, https://www.findagrave.com/memorial/124225426, 124225426. 6520. “Together We Served,” https://marines.togetherweserved.com/usmc/servlet/...Person&ID=145729. 6521. 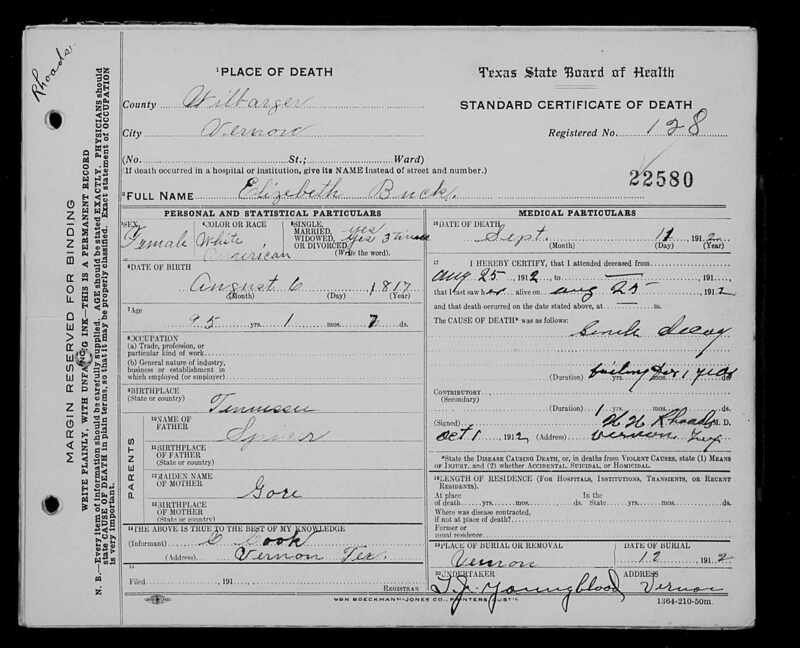 Elizabeth Buck, “Texas Deaths, 1890-1976,” September 11, 1912, Vernon, Wilbarger County, TX, https://www.familysearch.org/ark:/61903/1:1:K3WR-MT4. 6522. “Elizabeth Spicer Buck,” Find-A-Grave, https://www.findagrave.com/memorial/11535198, https://www.findagrave.com/memorial/182437335, 11535198, 182437335. 6523. 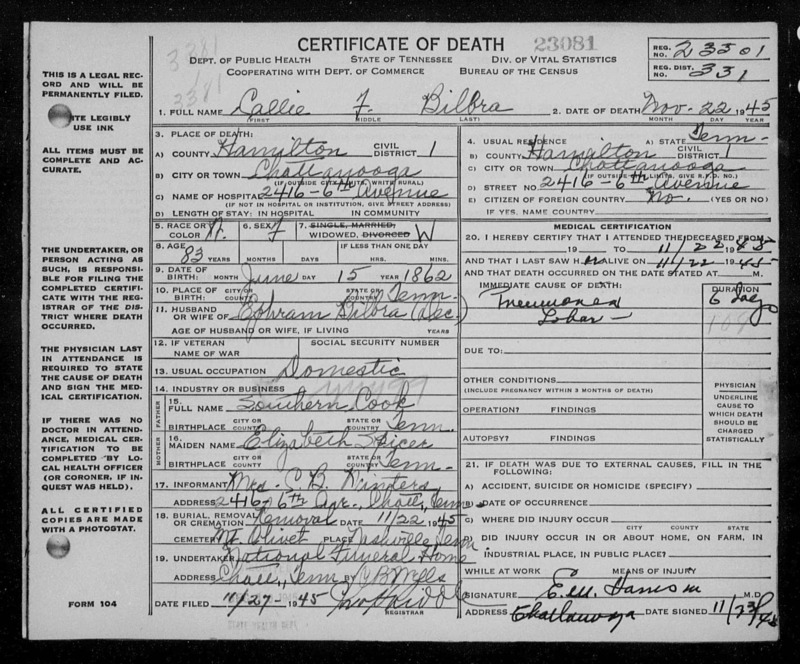 Callie F Bilbra, “Tennessee Death Records, 1914-1963,” November 22, 1945, Chattanooga, Hamilton County, TN, https://www.familysearch.org/ark:/61903/1:1:NSWW-PSY. 6524. “Callie Bilbra,” Find-A-Grave, https://www.findagrave.com/memorial/131147750, 131147750. 6525. “Ephram Bilbra,” Find-A-Grave, https://www.findagrave.com/memorial/131147756, 131147756. 6526. “William Wesley Dennis,” Find-A-Grave, https://www.findagrave.com/memorial/74550276, https://www.findagrave.com/memorial/25143092, 74550276, 25143092. 6527. 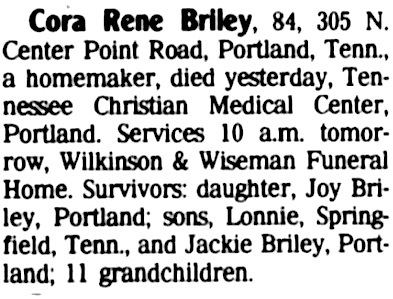 “Obituaries,” Cora Rene Briley, The Tennessean, Nashville, TN, July 22, 1994, 13. Cora Rene Briley, 84, 305 N. Center Point Road, Portland, Tenn., a homemaker, died yesterday, Tennessee Christian Medical Center, Portland. Services 10 a.m. tomorrow, Wilkinson & Wiseman Funeral Home. Survivors: daughter, Joy Briley, Portland; Sons, Lonnie, Springfield, Tenn., and Jackie Briley, Portland; 11 granchildren. 6528. 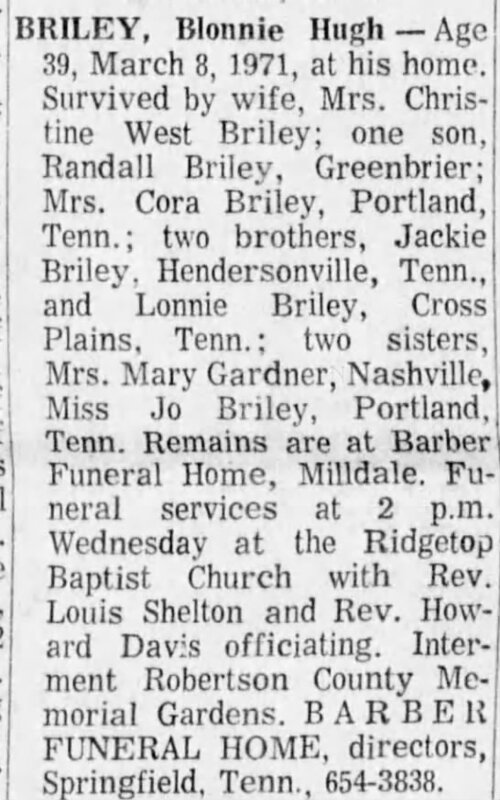 “Obituaries,” Blonnie Hugh Briley, The Tennessean, Nashville, TN, March 9, 1971, 24. BRILEY, Blonnie Hugh — Age 39, March 8, 1971, at his home. Survived by wife, Mrs. Christine West Briley; one son, Randall Briley, Greenbrier; Mrs. Cora Briley, Portland, Tenn.; two brothers, Jackie Briley, Hendersonville, Tenn., and Lonnie Briley, Cross Plains, Tenn.; two sisters, Mrs. Mary gardner, Nashville, Miss Jo Briley, Portland, Tenn. Remains are at Barber Funeral Home, Milldale. Funeral services at 2 p.m. Wednesday at the Ridgetop Baptist Church with Rev. Louis Shelton and Rev. Howard Davis officiating. Interment Robertson County Memorial Gardens. BARBER FUNERAL HOME, directors, springfield, Tenn., 654-3838. 6530. “Obituaries,” Lonnie T Briley. 6531. 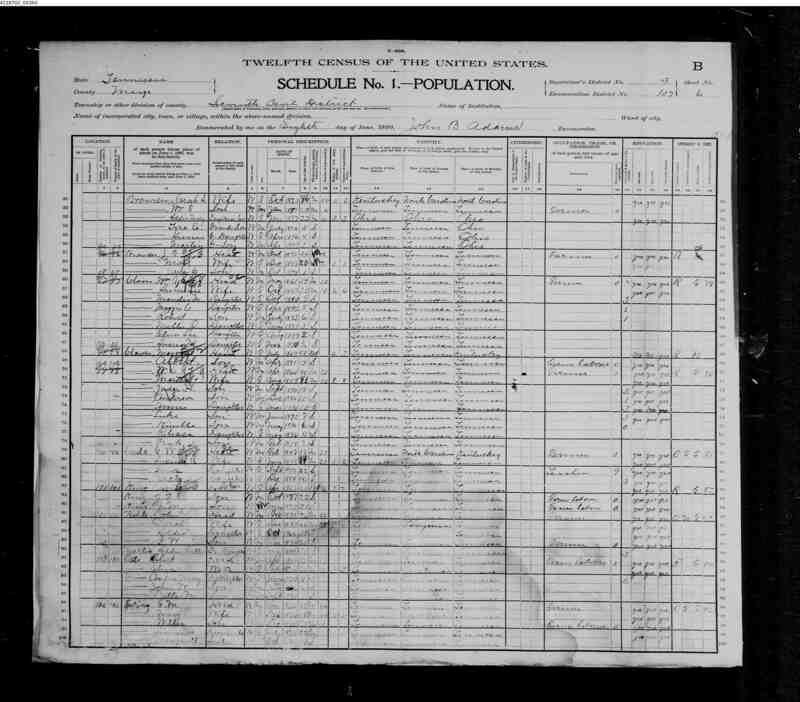 Hickman Briley and Cora Marker, “Tennessee State Marriage Index, 1780-2002,” November 6, 1926, Sumner County, TN, https://www.familysearch.org/ark:/61903/1:1:VNZT-NCW. 6532. 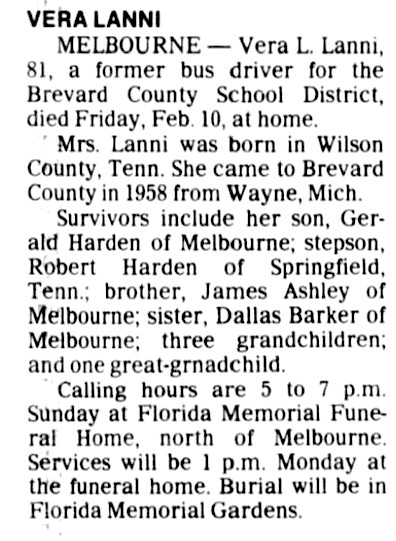 “Obituaries,” Vera Lanni, Florida Today, Cocoa, Florida, February 11, 1995, 15. MELBOURNE — Vera L. Lanni, 81, a former bus driver for the Brevard County School District, died Friday, Feb. 10, at home. Mrs. Lanni was born in Wilson County, Tenn. She came to Brevard County in 1958 from Wayne, Mich. Survivors include her son, Gerald Harden of Melbourne; stepson, Robert Harden of Springfield, Tenn.; brother, James Ashley of Melbourne; sister, Dallas Barker of Melbourne; three grandchildren; and one great-grandchild. Calling hours are 5 to 7 p.m. Sunday at Florida Memorial Funeral Home, north of Melbourne. Services will be 1 p.m. Monday at the funeral home. Burial will be in Florida Memorial Gardens. 6534. 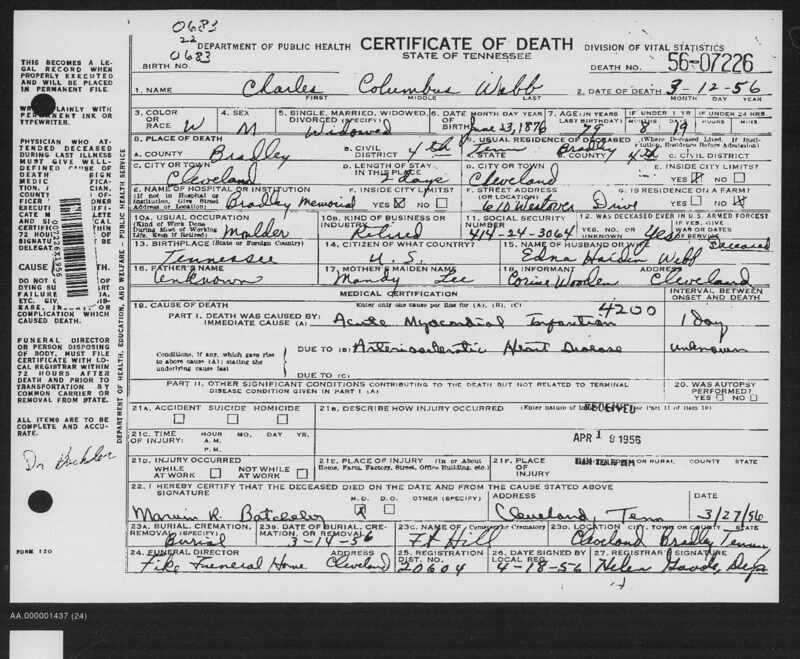 Charles Columbus Webb, “Tennessee Death Records, 1914-1963,” March 12, 1956, Cleveland, Bradley County, TN, https://www.familysearch.org/ark:/61903/1:1:QKM9-FF7S. 6535. Gravar.se, “Ludvig Axel Lindén,” http://www.gravar.se/en/forsamling/stenstorps-past...2/ludvig-axel-linden. 6536. Gravar.se, “Anna Margaret Lindén,” http://www.gravar.se/en/forsamling/stenstorps-past...anna-margaret-linden. 6537. Gravar.se, “Emma Linnéa Lindén,” http://www.gravar.se/en/forsamling/stenstorps-past...2/emma-linnea-linden. 6538. Gravar.se, “Eric Ludvig Lindén,” http://www.gravar.se/en/forsamling/stenstorps-past...2/eric-ludvig-linden. 6539. Gravar.se, “Vendla Charlotta Lindén,” http://www.gravar.se/en/forsamling/stenstorps-past...dla-charlotta-linden. 6540. Gravar.se, “Vera Lindén,” http://www.gravar.se/en/forsamling/stenstorps-past...gard/0/2/vera-linden. 6541. Gravar.se, “Nils Gösta Lindén,” http://www.gravar.se/en/forsamling/stenstorps-past.../2/nils-gosta-linden. 6542. “Axel Herman Larson,” Herndon Nonpareil, Herndon, KS, January 20, 1938. Axel Herman Larson was born in Vestergotland, Sweden, April 23, 1856 and fell asleep in the Lord January 11, 1938 at the age of 81 years, eight months and 18 days. 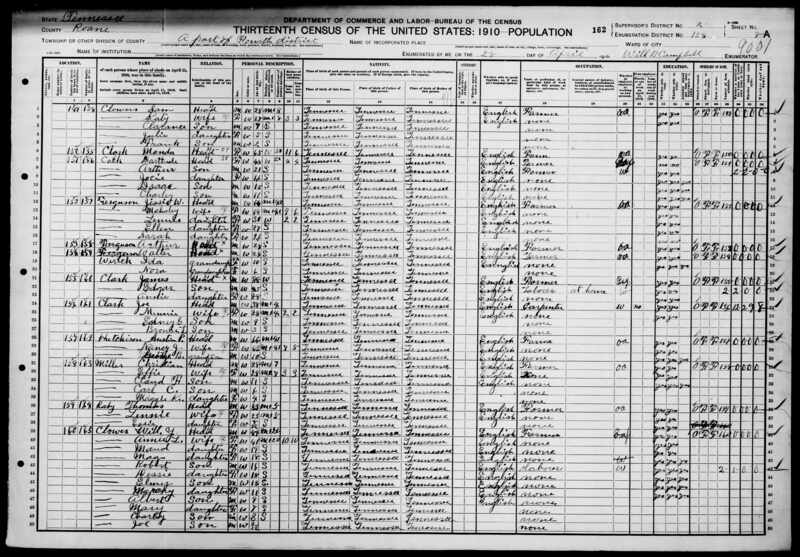 In 1868, at the age of 12 years, he immigrated with his parents to America. He first came to Chariton, Iowa, where he remained until 1887 when he came to Rawlins County, Kan. Here he made his hoe until his death. He was united in marriage to Anna Hoaglund of Herndon, Kan., March 27, 1895. Three children were born to this union. One son Elder N. died in infancy. He laves to mourn his departure, his wife, one son, David and one daughter, Elna,, both of Ludell, Kan. Also his youngest brother David L. Larson of Norquay, Saskatchewan, Can., besides a host of relatives and friends. Four sisters and three brothers preceded him in death. Mr. Larson was converted at the age of 21 and remained a devout Christian, highly respected by all who knew him. He was a charter member of the Swedish Mission Church. He will be greatly missed in the church and in the home. He has been failing in health for some time, becoming bedfast in August. He bore his illness with a cheerful mood and it was a joy to care for him and be at his bedside. Funeral services were held at the Swedish Mission church, Herndon, Kan., Thursday, January 13, conducted by Rev. F. Eastburg. The body was laid to rest in the Swedish Mission Cemetery. We wish to thank our relatives and friends for their help and sympathy during the illness and eath of our husband and father. 6543. Axel H Larson and Anna C Hoaglund, “Marriage License,” March 27, 1895, Thornton, Rawlins County, KS. 6544. “Sweden Household Examination Books,” 1884-1899, Fröjered AI 11, 1884-1899, Fröjered Parish, Skaraborgs, Västergötland, Sweden, Lämmagården, 305, 313. 6545. “Sweden Household Examination Books,” 1900-1916, Fröjered AI 11a 1, 1900-1916, Fröjered Parish, Skaraborgs, Västergötland, Sweden, Bondestorp Ellet, 9, 23. 6546. 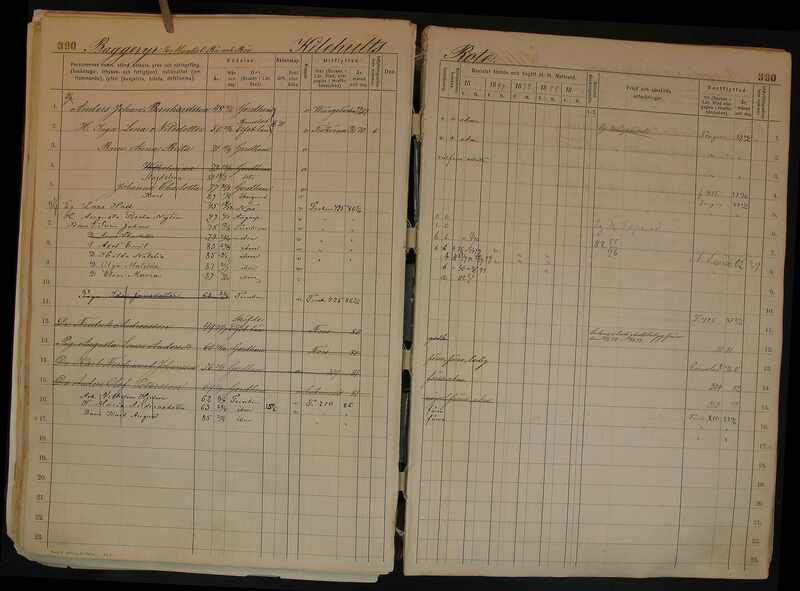 Karl Hilmer Andersson, “Mauretania Ship Manifest,” April 28, 1911, Ellis Island, NY, PASSENGER ID-101116130387, https://www.libertyellisfoundation.org/passenger-d...czo4OiJtYW5pZmVzdCI7, https://www.libertyellisfoundation.org/show-manife...Y4MDE0Ni5qcGciOw==/1. Image 145, Line 29: Andersson, Karl Hilmer, age 18, single male farm laborer. Can read and write. Swedish citizen and race born in Fröjered, Skbg. Nearest relative in Sweden was his grandmother Hedda Johansson in Klammesbo, Korsberga. Heading to Chicago, Illinois. Image 146, Line 29: Has a ticket to final destination paid for by himself. Carrying $25 in cash. Final destination is Uncle Linus Lindgren at 1154 W 59 St, Chicago, Illinois. Not a polygamist or anarchist. In good physical condition without deformity or crippled. Height of 5’9”, fair complection with brown hair and blue eyes with a scar on his left cheek. 6547. Johan Emil Rundberg and Agnes Gunhila Andersson, “Sweden Marriages, 1630-1920,” March 18, 1920, Skaraborg, Sweden, https://www.familysearch.org/ark:/61903/1:1:FKK9-DNG. 6548. “Sweden Household Examination Books,” 1900-1916, Fröjered AI 11a 1, 1900-1916, Fröjered Parish, Skaraborgs, Västergötland, Sweden, Kullebo, Granhagen, 186, 200. 6549. Jan Tybergsson, https://www.geni.com/people/Klara-Olivia-Nyl%C3%A9n/6000000069373693080, October 22, 2017. 6550. “Sweden Household Examination Books,” 1881 - 1902, Gärdhem AI 12, 1881 - 1902, Gärdhem Parish, Älvsborgs, Västergötland, Sweden, Baggeryr, 390, 77.